American Christian groups are working discreetly in China to spread an anti-abortion message through unofficial churches and to set up groups of activists to "save" women from abortion clinics. According to the conservative Christian website worldnews.org, American sponsored groups are spreading the message that abortion is wrong among Chinese Christian congregations and encouraging Chinese converts to go to into abortion clinics to talk women out of having abortions. According to an article on their website, an American under the pseudonym "Jim Peters" has been preaching the anti-abortion message to "packed congregations" including at official Protestant 'Three Self' churches. They also claim to have appealed successfully to Christian medical staff at one hospital to have women who seek abortions first undergo anti-abortion advice. The activities are co-ordinated by the groups such as "All Girls Allowed" set up by former Tiananmen student leader Chai Ling, and a network known as the China Life Alliance (CLA). "By linking resources from the experienced American pro-life movement to the leaders of the Chinese church, CLA was able to equip local believers quickly to start their own ministries," an article on the worldnews.org website claims. "The group has launched a network of safe houses for pregnant women, abortion rescue teams, a Christian legal aid ministry, a Chinese resource website, and a pregnancy help center ... so far about 20,000 churches have heard of the pro-life message, and each church that hears the message goes on to save two to five babies a year." As well as being "pro-life", the World News website propagates the pro-gun ownership policies of other US Christian conservative groups, and it is strongly opposed to the Affordable Care ('Obamacare') policies that aim to provide wider access to healthcare for US citizens. The US group say they are encouraging Chinese Christians to respect life and spread the anti-abortion message in various ways, and describe how one young member of a Chengdu congregation was arrested by police for passing out anti-abortion flyers. 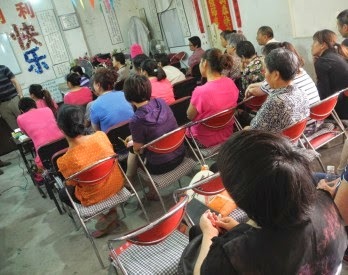 It claims that there are now about 8,200 preachers campaigning against abortion in their churches in China.